Image courtesy of Barbican, London, and Whitney Museum of American Art, New York. Courtesy of The Estate of Jean-Michel Basquiat. Matilde Andrades regularly took the subway to Museum Mile with her son Jean-Michel Basquiat. Their favourite destinations were MoMA and the Met. Nearer to home was the Brooklyn Museum, where Matilde enlisted Jean-Michel as a junior member when he was only six years old. At MoMA, between 1958 and 1981, Monet’s Water Lilies and Picasso’s Guernica were on display. 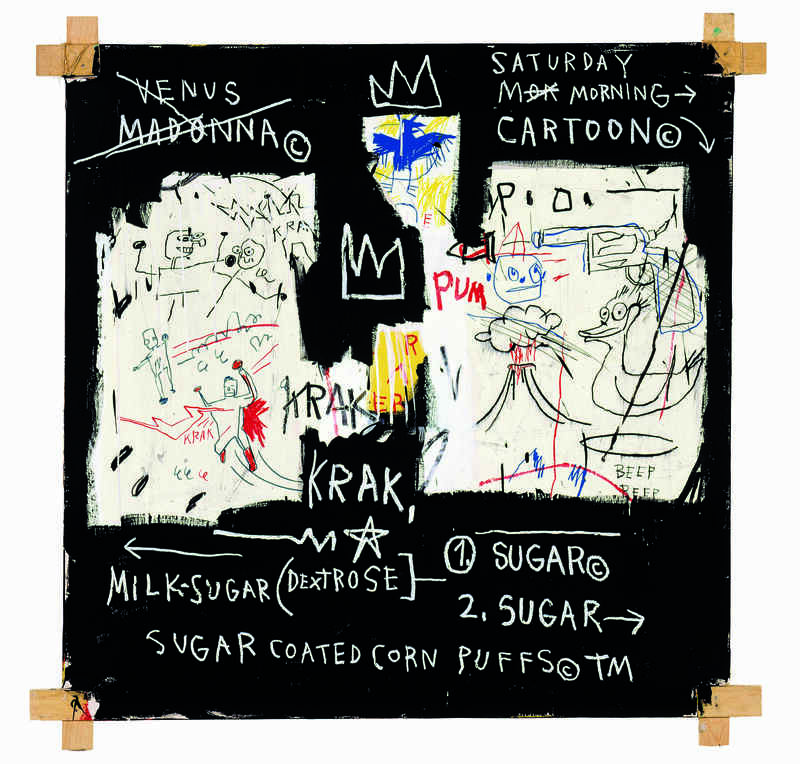 As an adult, Basquiat recalled the impression made on him by these paintings. Not only was he absorbed by the works, the works were absorbed into him. Born in Brooklyn to a Haitian father and a mother from a Puerto-Rican family, his sense of belonging, yet not belonging, made him all the more affected by what he saw. Like him, the paintings had a rich ancestral history that was eclipsed by their Anglophone setting. Matilde nurtured this receptivity. Between mother and son, museum visits developed into a folk tradition, a sacred rite of the in-between. It was not just Water Lilies and Guernica that were folded into Basquiat’s identity, but other works too. Later in life, a girlfriend would describe being awed by the way that at MoMA, he knew ‘every painting, every room’. Among curators, such formative experiences do not tend to be accounted for. There is an assumption that the rule-bound space of the gallery is not ‘child-friendly’. Equally prevalent is the Romantic idea of the child as the ultimate aesthetic subject; it was Baudelaire who insisted that ‘the child sees everything in a state of newness’. Basquiat’s story urges us to think beyond the poles of exclusion and simple enchantment, showing how art can become part of us. When I visit ‘Jean Michel Basquiat: Boom for Real at the Barbican’, I reflect on when, age five, I saw a Basquiat retrospective at the Whitney Museum of American Art. Preserved in my memory are scars of colour (what I now know to be mostly oil stick), skeletal hatchings and hatchings of skeletons: an unrelenting bittiness. More than the work, I remember the feelings the exhibition stirred. Because the artist was clearly of the present yet already dead, I was haunted, and each emaciated mark coalesced into a spectre. 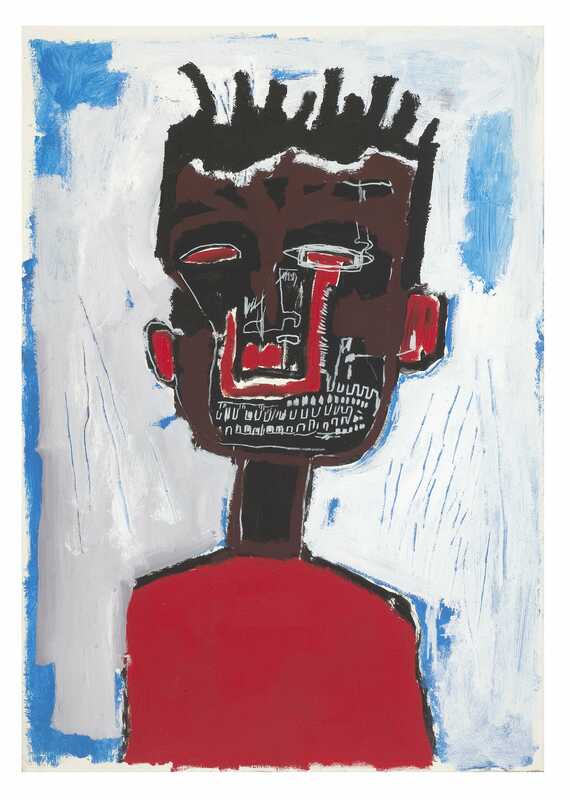 With his silhouette – dreadlocks shorter than my father’s – Basquiat was simultaneously familiar and disturbing, like a family friend who vanished without explanation. Later, a print of In Italian (1983) hung in our home. Watermelon colours, a floating head, two coins: these elements captured my imagination. The Basquiat presented at the Barbican is different to the one I encountered back then. It is true that I am now older than the artist was when he died, yet there is more to this discrepancy. Over the past few years, an awareness of identity politics has gripped younger generations contending with persistent inequality. This is the demographic that would surely be drawn to the UK’s first Basquiat show in 20 years. We might anticipate, then, an exhibition highlighting the artist’s diasporic roots. Or, we might expect an emphatically African American artist brought into relief by his status as a black man in a nation ravaged by racial terror. Black men, after all, are the protagonists of his oeuvre. 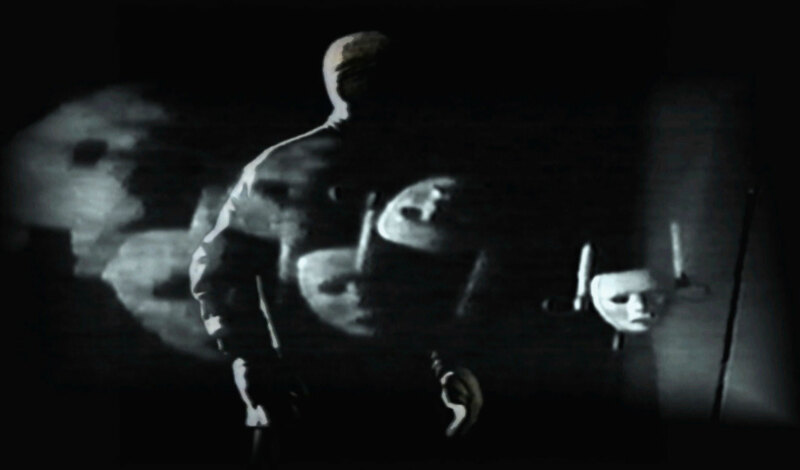 The Barbican exhibits several charged self-portraits, as well as Cathode (1984), a work strewn with various brown faces. But the figure we encounter is not a Black Lives Matter Basquiat, an artist acutely aware of his proximity to premature death. 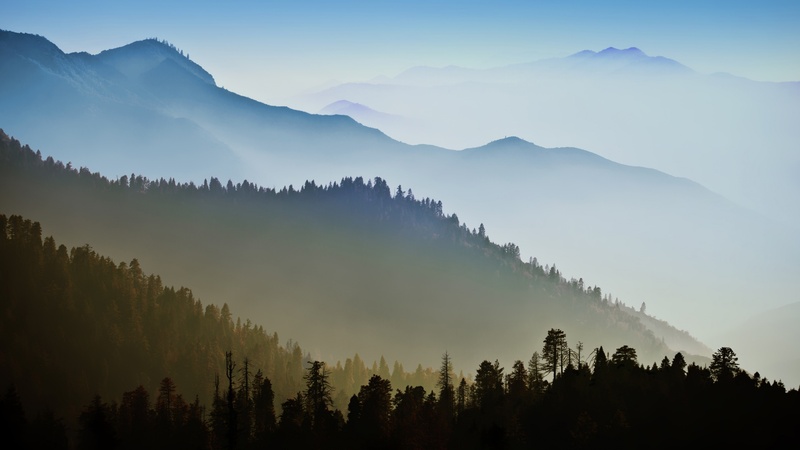 Today, there is also a separate, more pervasive discourse around identity that is entangled with consumerism. 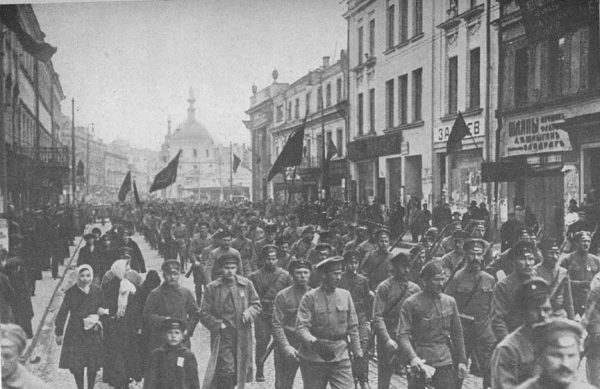 Its end is visibility rather than emancipation. To mark the film’s success, the lead actors in Moonlight stripped off for a series of Calvin Klein advertisements; Pirelli is set to release an edition of their pinup calendar featuring only black models, a move justified by the (white) photographer’s assertion that ‘Any girl should… have their own fairytale’; British Vogue’s casting of a mixed model for its December 2017 cover was heralded as a social justice triumph. 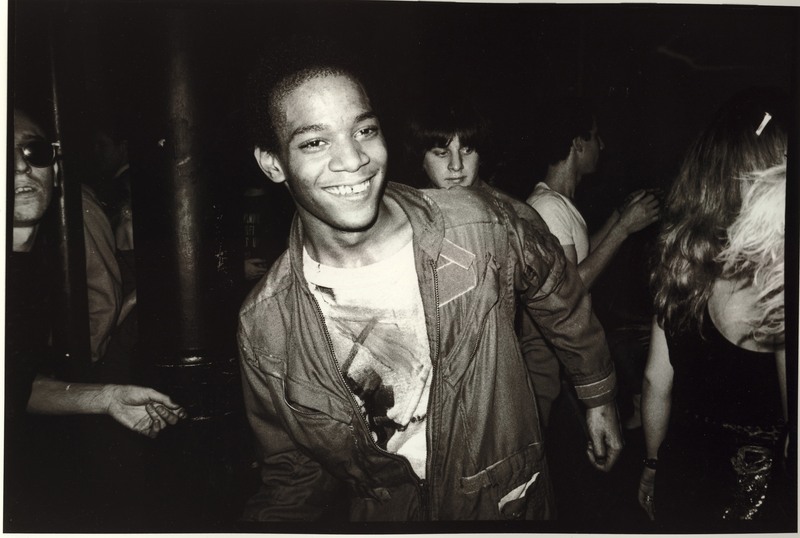 The Barbican puts forward an image of Basquiat that sits comfortably within this milieu. In the end, he comes across as little more than Andy Warhol’s disciple. Upstairs, where the show begins, eight rooms are given over to locating Basquiat in the downtown New York scene: a world in which Andy Warhol was God, and Debbie Harry, who bought one of Basquiat’s first paintings, ‘a real life fairy godmother’. 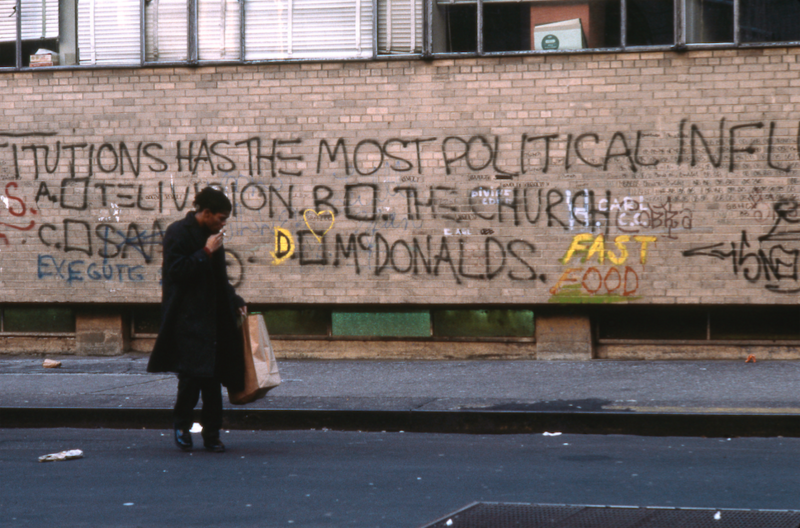 The opening room looks at ‘New York, New Wave’, a 1981 group show at the Institute for Art and Urban Resources (now MoMA PS1). Bearing in mind the brevity of Basquiat’s life, this is a disappointing point of departure. Up to that point he had been known, if at all, as the co-author of cryptic statements sprayed onto the walls of Soho and the Village under the tag SAMO©, or as a member of the noise band Gray. 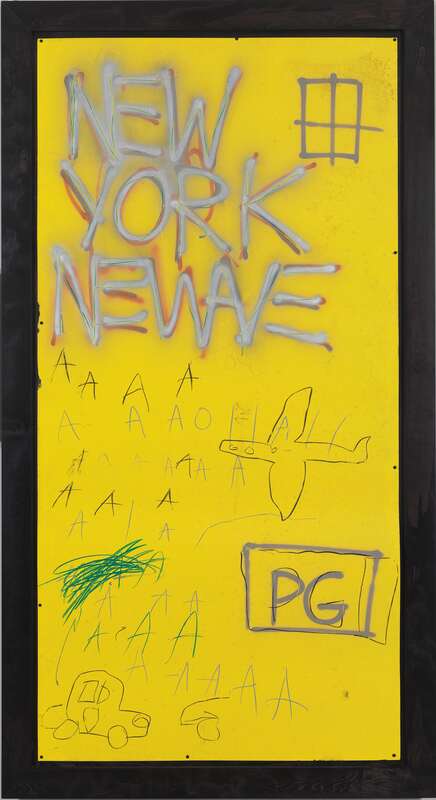 Feted by gallerists and prominent critics, ‘New York, New Wave’ announced his public debut as a fine artist. The Barbican’s second room jumps back to look at SAMO©, but by this time, it is too late. To open a solo exhibition by way of another exhibition is to trap an artist in a vitrine, turning them into a commodity. ‘Boom for Real’ fixes Basquiat inside the window of time when his art and his body become capital. Evidently, the curators of the show believe such an approach to be fitting. Never before, they claim, has Basquiat been anchored in relation to the downtown scene. In the catalogue, Eleanor Nairne describes his life as a performance piece designed for that particular audience. This extends to his passion for reading. By drawing on a wide range of literary sources, the artist was merely ‘performing knowledge’. Nairne takes her argument a step further, wrenching Basquiat’s alleged performativity from the realm of the avant-garde art into athletics: ‘Basquiat turned his intellect into a sport,’ she writes, ‘using the speed with which he executed work to lure viewers into false presumptions before delivering a blow with the depth of his references.’ For a black artist, then, an intellect cannot be an intellect. It has to be something bodily. 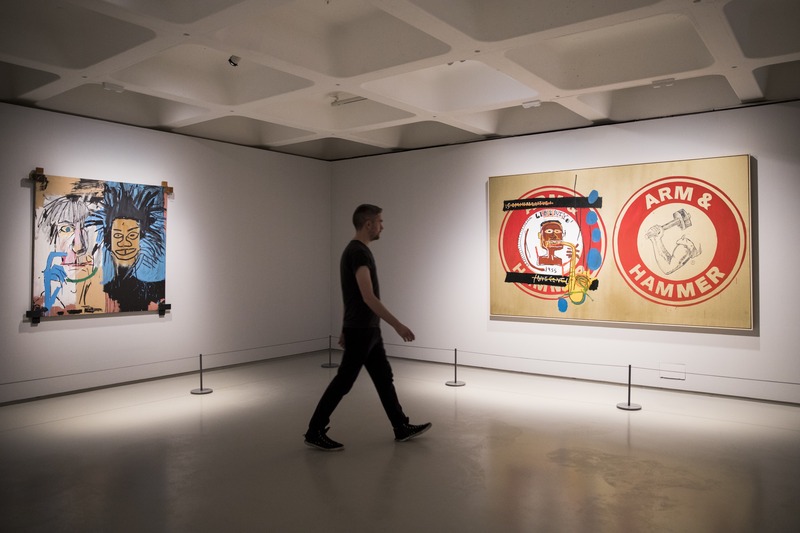 In the exhibition itself, two whole sections are devoted to Basquiat’s intellectual pursuits, as if visitors ought to be surprised at his erudition. ‘Art History’ addresses his familiarity with – or as the curators put it ‘consumption’ of – ‘the mainstream canon of western art’, African art, and the Abstract Expressionists, while the section ‘Encyclopedia’ centres on his personal library. It is hard to imagine such emphasis being placed on the ownership of books if a non-black artist was under consideration. We are given the impression that Basquiat was modelling his autodidacticism for spectators. Discussing Dos Cabezas (1982), a double portrait Basquiat made of himself and Warhol, Nairne continues to underplay Basquiat’s depth. She reads the painting as the artist ‘expressing his desire to achieve parity with his idol’. A more empathetic look suggests otherwise. 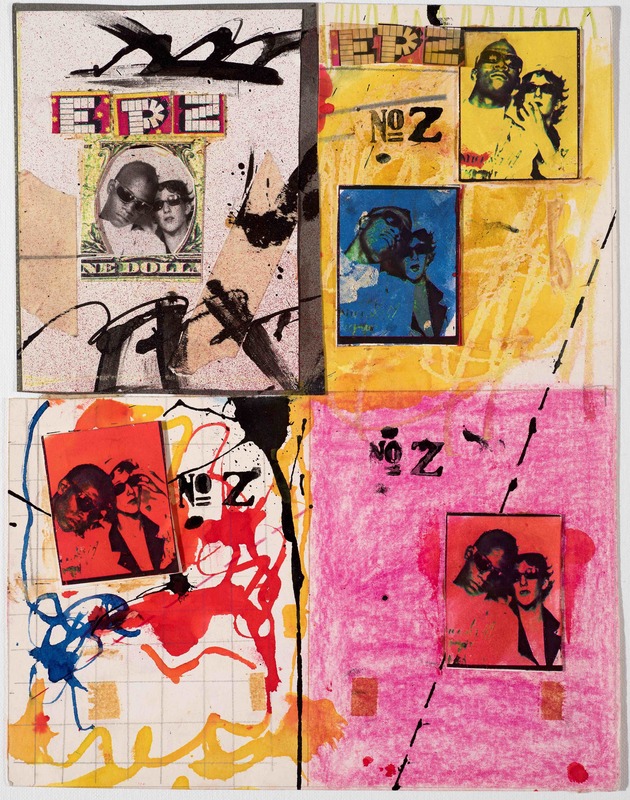 Warhol’s face is painted in a realistic style; tonal values are introduced around the nose, giving the head a fleshiness unusual in Basquiat’s work. Conversely, the self-portrait is all line, its irises mere dots. 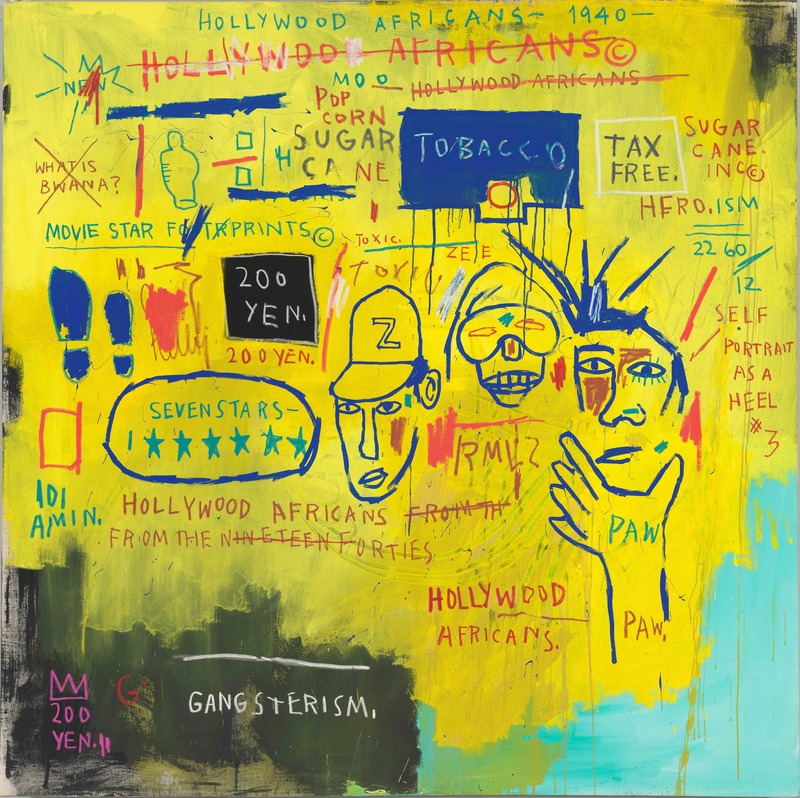 In 1994, bell hooks identified the ‘gaze which can only recognise Basquiat if he is in the company of Warhol or some other highly visible white figure.’ The painting anticipates this tendency, as if Basquiat knew that by aligning himself with such an influential figure, this would be his fate. Dos Cabezas is a painting of ambivalence, of simultaneous excitement and self-disgust. That its title is in Spanish, Basquiat’s first language, conveys a hesitancy to give himself away. 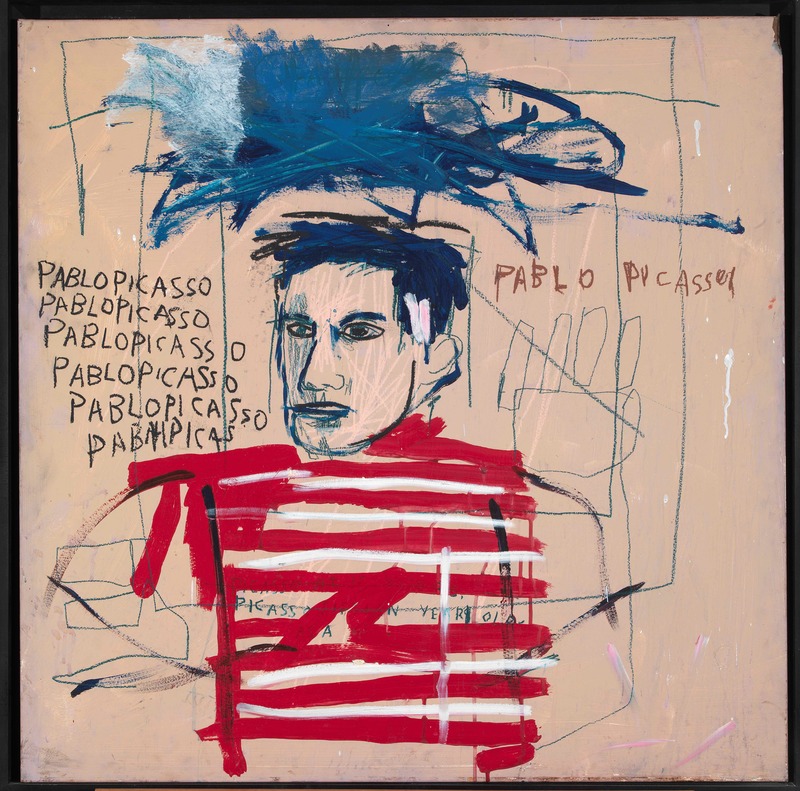 Nairne writes that as ‘a true postmodernist, Basquiat understood identity to be a construct’. Labelling the artist postmodern is another way of forcing him into Warhol’s shadow. For Fredric Jameson, Warhol’s works are the paradigmatic postmodern texts. Jameson describes Warhol’s works as transcending the existential anxieties that haunted the modernist imagination. Such anxieties endure in Basquiat’s art. The gulf between approaches is dramatised in Arm and Hammer II (1984), a collaboration between the two artists. On a golden canvas, Warhol painted two identical logos for the brand of baking soda-based products: a red circle containing a white muscular arm wielding a hammer. On the right – Warhol’s side – the logo remains intact. On the left, Basquiat has painted over the arm, repurposing the circle into a roundel for a portrait of Charlie Parker. Basquiat identified with Parker – both were avant-garde black artists, both were in car accidents early on in life, and both used heroin. Presented as a bust, Parker’s tender skin is exposed as the blues wafts out from his saxophone. In Arm and Hammer II, a bleached, consumerist postmodernism is placed in direct contrast to the icon of a modernism cultivated by black practitioners. The painting pits nuance against apathy, the insistence of humanity against a hollowed-out ideal of the human form. Dazzled by images of downtown glamour, by the time I arrive downstairs my impression of the artist has converged with a polaroid of Madonna wearing a bubblegum pink wig, hung in a room titled ‘The Scene’. What would my child-self have made of this? What would the child Basquiat, accompanied by Matilde, have made of such an approach to one of his heroes? The folk-tradition, the sacred-rite of the in between, is undermined at the Barbican. 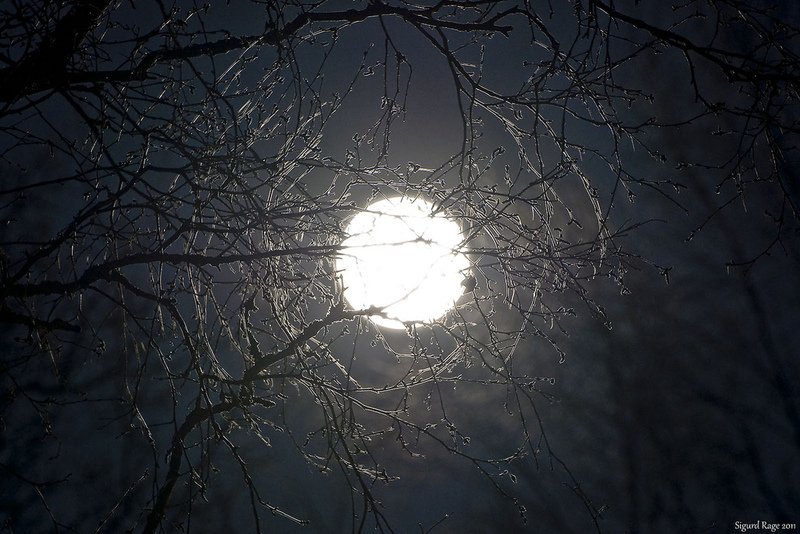 There is no space to be haunted, no time to let the art become part of who we are. has recently finished a book on the body in nineteenth century British art. She has curated exhibitions at Tate Britain and the Huntington, and held fellowships in Naples, New Haven and Los Angeles.